NEW YORK (CNNMoney) -- You will soon be able to pay your friend back for dinner or give your kid $100 by simply logging in to your bank account and entering their name and phone number. No cash, check, PayPal or silly app required. Bank of America (BAC, Fortune 500), JPMorgan Chase (JPM, Fortune 500) and Wells Fargo (WFC, Fortune 500) announced Wednesday that they will launch a system, called clearXchange, allowing customers to transfer money electronically through their existing accounts. The new cash transfer system is a direct attempt to rival PayPal, owned by online auctioneer eBay (EBAY, Fortune 500) and currently the dominant player in the person-to-person payment space. This kind of streamlined venture is rare among banks, who are constantly battling each other for customers. "We call this a model of 'coopetition,' where we're actually cooperating with our competitors," said John Feldman, general manager of clearXchange and a former employee of Bank of America. As more customers shift away from traditional check and cash payments, having an online transfer system will be crucial to keeping customers loyal, Feldman said. Whereas PayPal and other systems require you to create an account separate from your bank account to transfer money, this new service will let customers simply log in to their existing bank account and enter the recipient's name and e-mail address or phone number. The person they're paying will then instantaneously receive an alert that money is being sent their way. "We are the air traffic controllers, taking the messages from the separate banks and transferring them to consumers," said Feldman. For now, the person on the receiving end must belong to one of the three member banks, but they anticipate that other large financial institutions will soon join the venture, and that it will one day be possible to transfer money to anyone. 0:00 / 2:26 Which bank is right for you? ClearXchange will charge each financial institution to use the service; each bank can then decide whether its customers need to pay a fee for using it. Currently, customers aren't charged. Bank of America and Wells Fargo are testing the new service for customers in Arizona, and Chase will join the tests soon. Soon after completing the pilot in Arizona, the banks will expand the testing to a second region. In about a year, the banks expect to be ready to roll out the service nationally. ClearXchange says its system will be more convenient and secure, since it doesn't require consumers to provide checking account details like routing numbers. It will also allow customers to see just how much money they have in their account before they transfer money to someone else. 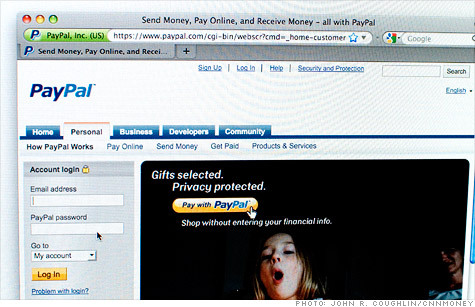 While PayPal is an obvious rival, the banks said traditional checks and cash are its biggest competitors. "People are used to doing it the old-fashioned way, with writing checks or paying cash," said Mike Kennedy, head of payments strategy at Wells Fargo. "But there's a large and growing market for online person-to-person payments, and we think clearXchange is the best thing in the market for it."